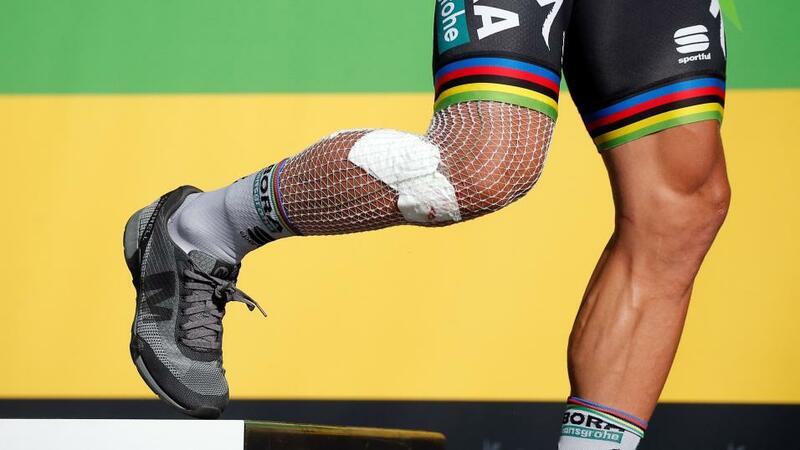 "Peter Sagan has been the best sprinter in this year's Tour: mathematically sewing up the Green Jersey a couple of days' ago and winning three stages..."
This stage always looked like a bit of an anomaly when the route was announced. Sandwiched between the expectant excitement (that somehow never came) offered by Stage 17, and the monster day in the mountains of Stage 19, which sees the race visit most of the Pyrenean greatest hits, Stage 18 looked like an afterthought, or a way of meeting a contractual requirement to always visit the town of Pau, which seems to have been the way of recent Tours, with organisers no doubt ruing the non-existence of nearby towns called Tinky-Winky, Dipsy and La La. Still, it allows us, and the riders, time to draw breath, and will give the sprint teams (or what remains of them) the opportunity to dangle a break-away off the front, before shutting them down in the final kilometres all ready for a bunch sprint. The course is relatively flat, with a couple of Category Four climbs. The finale is fast - it descends over the last few kilometres - and there are a number of roundabouts to negotiate on the approach, as well as a left-hand turn inside the final kilometre. It's not super-technical, but not free of danger either. Peter Sagan has been the best sprinter in this year's Tour - mathematically sewing up the Green Jersey a couple of days' ago and winning three stages - and given that he is one of only four remaining in the peloton who can claim genuine speedster credentials, his odds of [4.00] look about right. Not only does he have the sprint form, but he is likely to have survived the mountain exertions better than his main rivals, who will be depleted from what they have faced over the last week or so. Assuming a break-away can't succeed, Alexander Kristoff ([4.00]), Arnaud Demare ([4.00]) and Sonny Colbrelli ([19.00]) are the only riders who can compete with Sagan in a bunch sprint. Anyone else - and I'm thinking Edvald Boasson Hagen ([23.00]) and John Degenkolb ([11.00]) - would need to try something creative to have a hope of competing on a finish that favours out-and-out top speed. They are ones to watch in-play. Kristoff, Demare and Sagan finished tightly bound on Stage 13, with Sagan just getting the nod; however, the Slovakian left his effort late there, and would have arguably won more comfortably had he timed his sprint better. Looking for value, then, Colbrelli is the bet to combine with Sagan, for all the same reasons as when I recommended we support him on that Stage 13, where he ultimately ran into bad luck on the approach. After the slight anti-climax of Stage 17, the Yellow Jersey competition looks securely on course to go the way of Geraint Thomas, who is around [1.16]. It's a question of surviving three stages for Thomas: avoid calamity on Stage 18; ride defensively on the big mountain day and don't lose any time in the Pyrenees; and get as close to Dumoulin on the time trial as he can (which should be very close indeed). It should be straightforward, but the slight buoyancy in his odds represent a lingering doubt about his ability to last a full three weeks. Meanwhile, autopsies around Froome's performance may well focus on his Giro exertions, which will be questioned in hindsight. A subtext to the struggle for General Classification honours came by way of Pierre Latour on Stage 17 in the White Jersey competition, which briefly saw his odds go bigger than even-money as he buried himself in an attempt to set up an attack for his team-mate, Romain Bardet, raising concerns that he would then haemorrhage time to his main rivals. He didn't, and he looks set to deliver on our pre-Tour opposition to Sky's Egan Bernal. Another excellent day in the mountains for Julian Alaphilippe saw him hit [1.01] in that competition, effectively meaning that all of the jerseys are now wrapped-up, save for any disaster striking the presumptive champions.